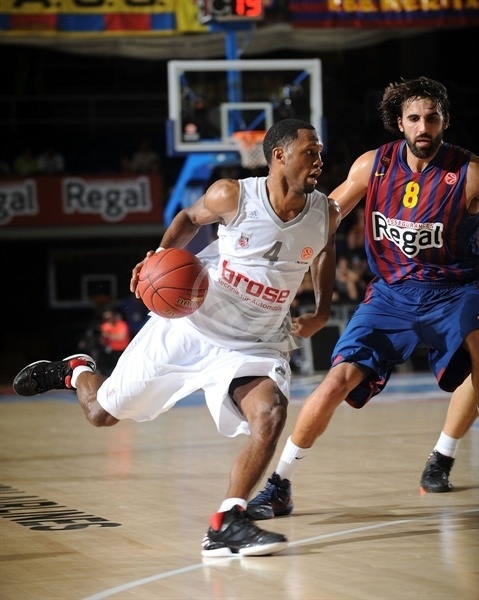 FC Barcelona Regal cruised to a 72-60 win over Brose Baskets Bamberg to start their Turkish Airlines Euroleague campaign Friday night at Palau Blaugrana. Spanish champs took control of the game early, jumped to a double-digit advantage with a 15-0 first quarter run and never looked back. 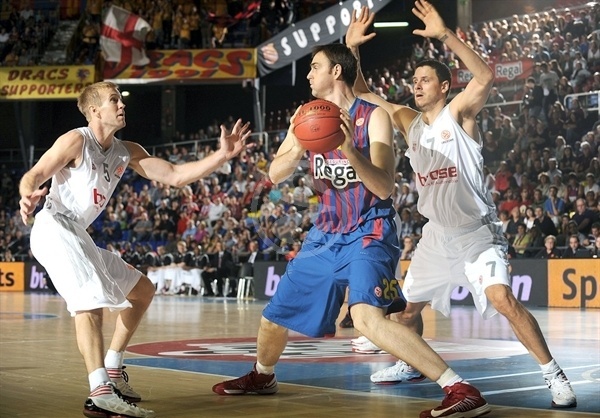 Ante Tomic was a great inside presence for Barcelona with 12 points, 9 rebounds, 4 assists and 2 blocks. 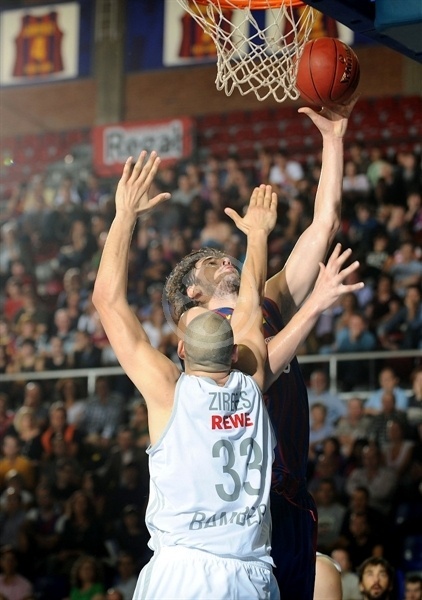 Pete Mickeal also scored 12, Erazem Lorbek added 11 and C.J. Wallace had 10. 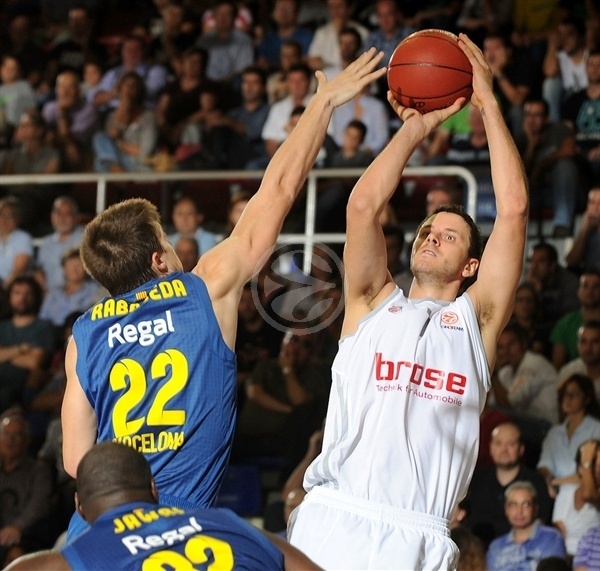 Bostjan Nachbar scored Bamberg’s first 9 points in the game and finished with game-high 20 points, while Latavious Williams and Maik Zirbes added 8 apiece. 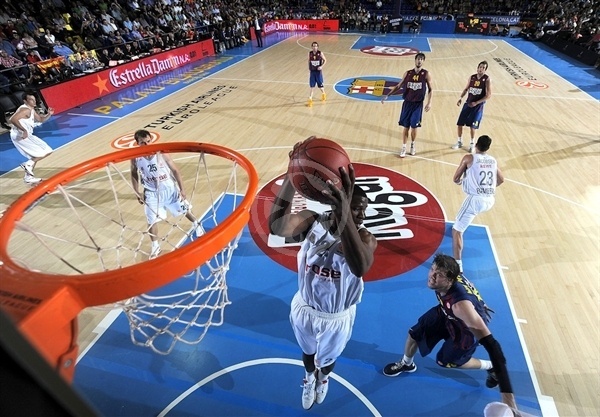 Nachbar scored a triple after nearly two minutes to start the scoring, but it was Barcelona that found its offensive rhythm first. Close range baskets from Ante Tomic were on both ends of a 15-0 run that also had contributions from Lorbek and Marcelinho Huertas, a triple from Joe Ingles and 4 free throws from Mickeal. The visitors failed to convert on 10 of their first 11 possessions before a runner from Nachbar ended the draught. A three-pointer from Wallace made it 20-5 after seven minutes. Nachbar proved to be Bamberg’s only scorer in the first quarter, while Wallace and Juan Carlos Navarro made it 26-9 after one quarter. Navarro’s runner-plus-foul made it a 22-point game in the opening seconds of the second quarter before Sharrod Ford answered with a tip-in to become only the second scorer for Bamberg in the game. Casey Jacobsen soon added a three-pointer. Wallace answered back with his second three of the game, but the visitors found success with zone defense and managed to cut the deficit to 32-19 with a triple from John Goldsberry and basket from Williams, which forced head coach Xavier Pascual to call a timeout. 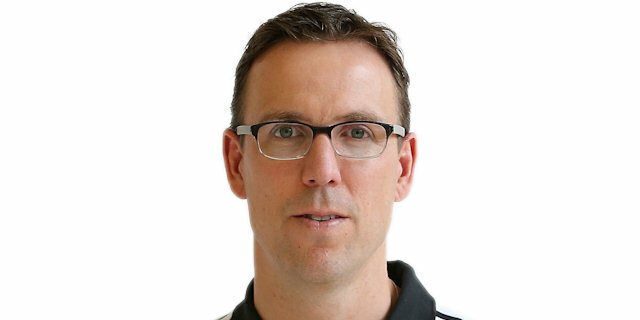 That helped Barcelona, as Lorbek’s basket-plus-foul snapped a 3-10 Bamberg run and Sarunas Jasikevicius made a runner to extend the lead to 37-21 midway through the second quarter. 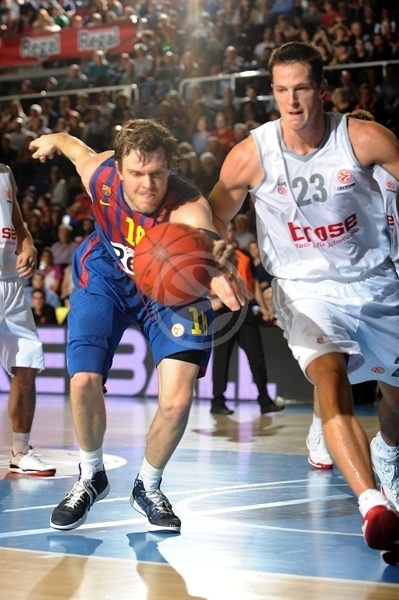 Jacobsen and Nachbar traded close-range baskets with Tomic, and neither team managed to score a single field goal in the final two and a half minutes of the half as Barcelona took a 43-26 advantage into the break. Nachbar started the scoring in the third quarter, Anton Gavel followed with a triple and Zirbes added a couple of layups, but Mickeal and Lorbek each scored twice in the paint to keep Barcelona’s lead safe. It was 54-37 at the halfway mark of the third quarter. Teddy Gipson then hit a runner, however Tomic answered right back showing some great skill underneath the rim. Mickael and Navarro hit jumpers and Huertas made a Navarro-like runner to give the hosts their largest lead to that point, 62-39. Gipson and Williams cut it to 64-44 to make it a round 20-point game entering final 10 minutes. With a large deficit, the German champions tried to push the tempo and finish their possessions early, but all they got from it in the first five minutes of the quarter were baskets from Jacobsen and Williams. 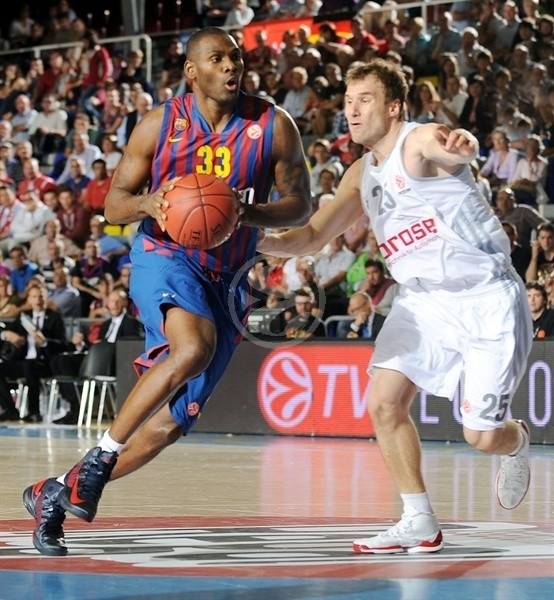 Wallace and Jasikevicius maintained the 20-point Barca lead and with victory already secured, Coach Pascual rested his starters. Gavel and Nachbar used the hosts’ relaxed approach to cut the deficit to 70-55 and Zirbes and Gipson made it 72-60 in the final minute of the contest. "We are happy with this win. It is always difficult to start the Euroleague. It was an important challenge against a team that came here undefeated. We had a good defensive game but also did well on offense, looking for extra passes and playing well. We increased the difference and disconnected a bit in the fourth quarter. That left the final difference at 12 points, which I think it could have been bigger for what we showed on the court. We took a step forward on defense, reading the game better with small mistakes to be polished. We still make mistakes and need some time together. Following many defensive rules has been a good part of our success in the past and has to keep being that way in the future. I am very happy for how our fans welcomed Jasikevicius. Our fans are close to the team at all times. Saras deserves this and more. There had to be a moment like that. That's in the books and now he has the turn into an important player for us." 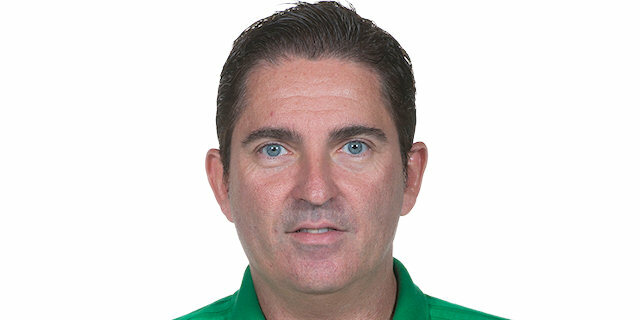 "I congratulate the Barcelona team and Coach Pascual on an good performance tonight. I think the story to this game is relatively clear for me. I think in the opening phases, we had good shots that we did not convert. We put our heads down very quickly, I think you could see. Especially our guys who didn't have much Euroleague experience really struggled in that situation. Barca built a sizable lead early and we were running from behind. You can't do that here and expect to have a chance. And that was exactly how it worked. I thought we fought hard in the second half and gained some respect back, but obviously we're going to have to play better in the Euroleague to win games."